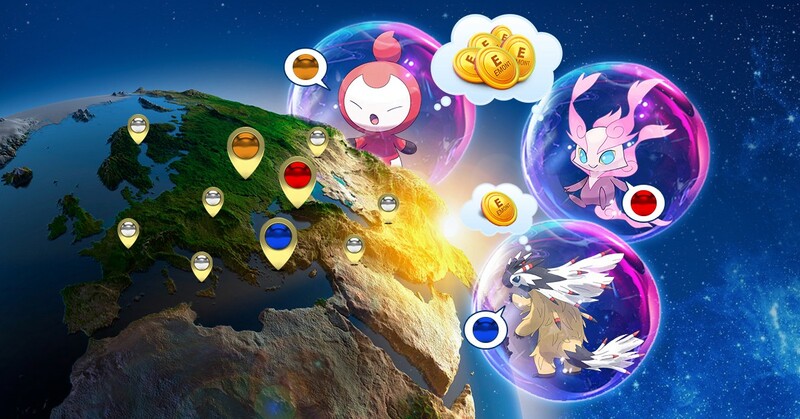 “Etheremon has constantly been surprising the community” — said one of our players. We are working hard everyday to deserve that compliment, by constantly improving and offering something new, such as Adventure Mode. The Adventure Mode might be the most important game mode to date. It will bring the dynamic and interactivity of the gameplay to the whole new level, setting foundation for many more cool features to come! We will use this entire post to explain in detail what Adventure site hosts and Mon-seekers can expect right after the mode launch, which will take place around in mid-July, 1 month after Adventure Mode Pre-sale ends. There will be exactly 108 Adventure Sites in the Etheremon’s world. Only 54 sites will be open for auctioning in the Pre-sale event starting from 26th May 2018. The other 54 will NOT be released in 2018 (this year) but reserved for future development. Each site is divided into 10 parts to be owned by 10 winners in the Pre-sale. Each ownership is an ERC-721 token, which can be freely traded on the market. Exploration was also mentioned in great details in our #1 post. This is the primary game of the Adventure Mode, in which players send their monsters around the world to explore different Adventure sites and collect amazing rewards (EMONTs, EXPs, Booster Shards, Level-up pills, Mystery Monsters). Player will not be able to choose a specific site. Each Monster can only visit a few sites, associated with its type (e.g. Fire, Water, Ice,…), and a random one will be selected in each adventure. Site hosts earn permanent income from Monsters’ adventures in terms of adventure fees. 90% of the fee will be equally divided among 10 hosts and the remaining 10% will go to Etheremon team for contract maintenance. Default fee will be set at 0.01 ETH or 15 EMONT and the site hosts can determine the adventure fee afterwards. It will be a single number calculated from all the fees input by the site’s hosts (all 540 site hosts). 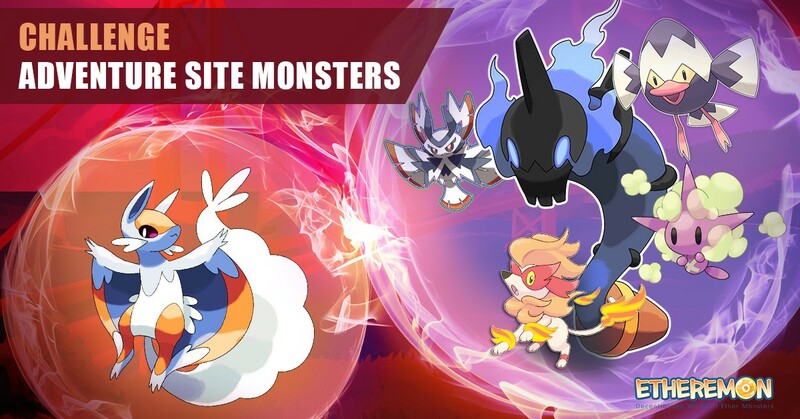 10 site hosts in each Adventure site can build a gym where each host will be able to assign 1 monster to guard it. A player can challenge these sites’ hosts by sending a monster to fight against their gym-guarding ones. He can choose a specific site to challenge. However, to locate gym in a site, that site must be explored by his Monsters first. In each challenge, 5 out of 10 guarding monsters will be selected randomly to join 5 battles with the player’s monster. The challenger will gain EXP for every battle and also collect a special reward if it can beat all 5 guarding monsters. To sum up, at the beginning of the Adventure Mode (to be released in mid-July), there will be 2 games available to play: Exploration and Challenge. For site hosts, these are two ways to generate passive income. For players, they can choose to send their monsters for treasure hunting or fight other fierce and strong monsters in the most challenging gyms. Who will be the first to conquer all Adventure sites’ gyms, we can’t wait to see! 1. What does it mean by site hosts setting fee? A: Default fee is set in the case there are no fee submissions from site hosts. We will have a logic of fee determination for each game mode using all fee submissions of site hosts. Once a site host submits a fee for the Exploration or Challenge game mode, calculation logic will check and re-calculate fee for that game mode. How the calculation logic works will be shared before the game is launched, but rest assured it will be very fair for everyone. 2. How many fees will there be in the Adventure Mode? A: There will be exactly 1 fee for the Exploration game, and 54 Challenge fees associated with 54 sites. Exploration game fee is determined from all 540 site hosts’ submissions, while Challenge fee for each site is determined from fee submissions of 10 hosts of that site. From January to April, we saw a total volume of 125 ETH from Casual and Practice modes and number of battles has been growing 37% month-over-month to over 45,000 battles in April only. With exciting casual gameplay, Adventure mode might become the most favourable game mode in the near future.